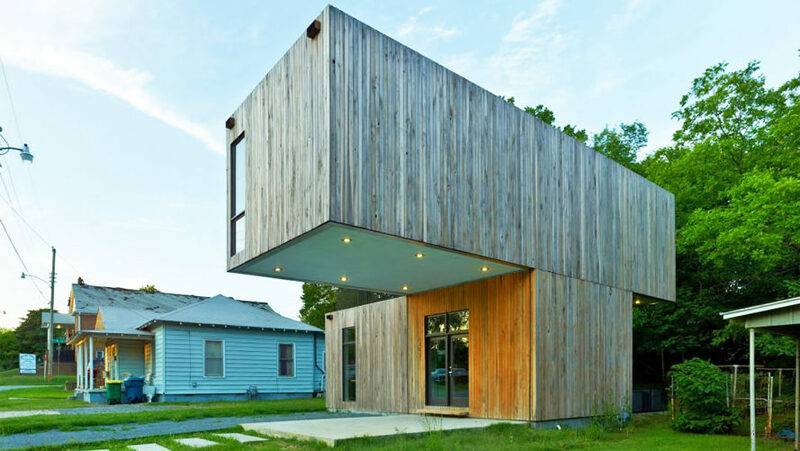 This prefab house in Little Rock, Arkansas, is a modular residence constructed by the students at the Fay Jones School of Architecture and Design. Two 16-by-32-foot box-shaped modules contain all the necessary amenities with two bedrooms and were lightweight enough to be easily transported and installed at the site in Little Rock. The modules were stacked perpendicular to one another, with the lower volume housing the kitchen, living and dining room and a small WC nestled under the stairs. A lightweight steel truss that run along the longer side of the module allow the projecting elements of the top volume. The entire house cost $136,000 to construct – $136 per square foot. “By rotating the modules perpendicular to each other, three exterior spaces are created — two porches covered by the cantilevers and a roof deck above the kitchen on top of the lower module,” said the team. The modules were stacked perpendicular to one another, with the lower volume housing the kitchen, living and dining room and a small WC nestled under the stairs. A lightweight steel truss that run along the longer side of the module allow the projecting elements of the top volume. The entire house cost $136,000 to construct – $136 per square foot. "By rotating the modules perpendicular to each other, three exterior spaces are created — two porches covered by the cantilevers and a roof deck above the kitchen on top of the lower module," said the team.